My first purchase was buying additional shares of a company I already own, Emerson Electric (EMR). EMR pays a dividend of 3.49% and has a 3-year dividend growth rate of 5.5%, 5-year dividend growth rate of 7.0%, and a 10-year dividend growth rate of 8.5%. I already owned 46.9153 shares in my Roth IRA and this purchase lowers my cost basis as well as increasing my annual dividends by $108.30. Not too many stocks are at a discount to my initial buying price so I thought I’d better add more now while it’s still down. The second purchase was Kroger Company, symbol KR. It operates retail food and drug stores, multi-department stores, jewelry stores and convenience stores and even produces the store brand food sold at its stores. There’s none that I know of near me, but they are very popular in Michigan and a new store was opening in Wisconsin near where I used to live. I heard about this stock on one of my favorite podcasts, Frank Curzio’s Wallstreet Unplugged: Ep. 439: How to Invest in Today’s Super-Risky Market. It sounded great and I decided to do more research. As dividend investors we are always looking for value. Here’s a stock that has a PE of 13.9 (cheaper than the market), yet is actually increasing earnings per share, revenue, and cash flow. Annualized over 5 years the earnings per share growth rate is 18.9%, the year-over-year revenue growth is 6.0%, and the cash flow is 8.7%. Why hasn’t the dividend community really heard about this one yet? Well, it kind of flies under the radar with a dividend yield of only 1.63%. A lot of people probably wouldn’t even see this one on their typical dividend stock screens. For younger investors that are looking for dividend growth plus capital gains, I’m guessing that this stock will be hard to beat. 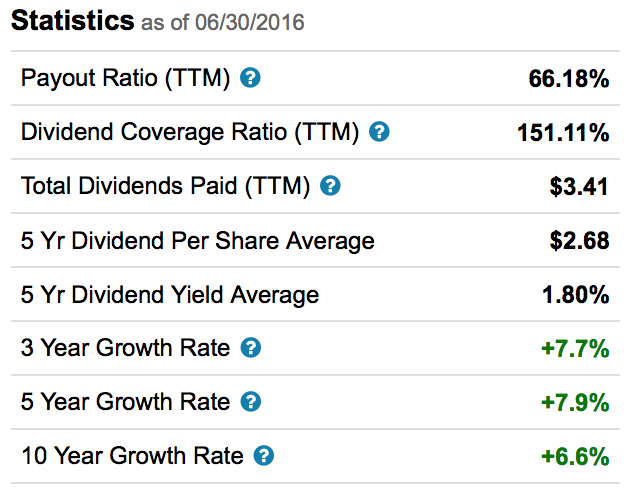 The payout ratio is only around 20% and the annualized 5 year dividend growth rate is 15.3%. My third dividend paying purchase was Diageo, symbol DEO. Diageo is an alcoholic beverage company headquartered in the UK and trades as an ADR on the NYSE. It also has an excellent record of dividend growth and has a well-covered payout ratio of just over 66%. It pays out twice a year at a yield currently of 2.76%. Unlike many US companies where quarterly dividend payouts are typically constant and then increase each year, DEO’s bi-annual payout amounts can vary. For example, the April 2014 dividend per share was $1.3063; the April 2015 dividend was $1.277; and the April 2015 dividend was $1.27. However, the October dividend increased from $2.0635 to $2.137 so the annual total does increase, just not has stepwise as the traditional US company. While Diageo is a new investment for me, I do recall some fellow dividend investors that have it in their portfolio. 57 shares of Emerson Electric for $3,095.44, adding $108.30/year in dividends. 100 shares of Kroger for $2,997.52, adding $48/year in dividends. 23 shares of Diageo for $2,674.85, adding $73.49/year in dividends. 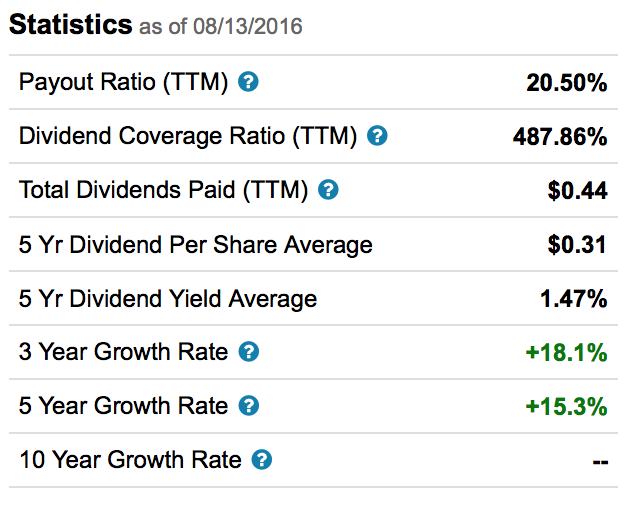 This brings my forward 12-month dividends to $5,041.84, finally back above $5k! Next goal is to get at least one month of over $1,000 in dividends collected. Looking ahead at the estimated dividends in my DivCalendar (click the DivCalendar tab along the bottom), I think March 2017 will be a good target for that. I’m currently at an estimated $824.88 without an additional fresh capital or reinvested dividends. I also bought two non-dividend paying more speculative companies, which I will be talking about separately in a future blog post. The really cool thing is that the combined value of my taxable brokerage and Roth IRA are now valued at $201,152. It is only back in July 2014 that my account was worth $100,000! This will definitely fluctuate with the market, but it is awesome that it doubled in just over 2 years. Well, I own two of the three. EMR and DEO. So I instantly love two of the three haha Kroger is a great grocery store as well. These companies will serve your portfolio well for a long, long time. Congrats on adding to your position in EMR and adding two new positions to your portfolio. Glad to finally join you on DEO as well. Seems like a lot of people own EMR but DEO is relatively uncommon. I wonder if that is because it pays twice a year and has fluctuating dividend payments? Many investors seem to like the steady raises that the majority of US-based companies offer. As you know, DEO’s dividends tend to be all over the place but at least remains on an upward trajectory! Congrats on increasing in dividend income. I’ve had EMR, still own deo. KR is interesting, my Kroger here in town was doing excellent until wegman came in and ruin the party. Everybody is shopping at wegman now, they traveled a long way to hunt for great deals at wegman. I have yet to go there, but I’m a little hesitant to take more than 10 shares of Kroger for now. You are absolutely on point with the company rewarding shareholders with dividend increase, stock split, stock buy backs.